'We are sorry we have taken your table but we do follow all your recommendations". I looked up and saw three young girls, or should I say young ladies, standing in front of me. I was at Candies that morning nursing a very very sore back. 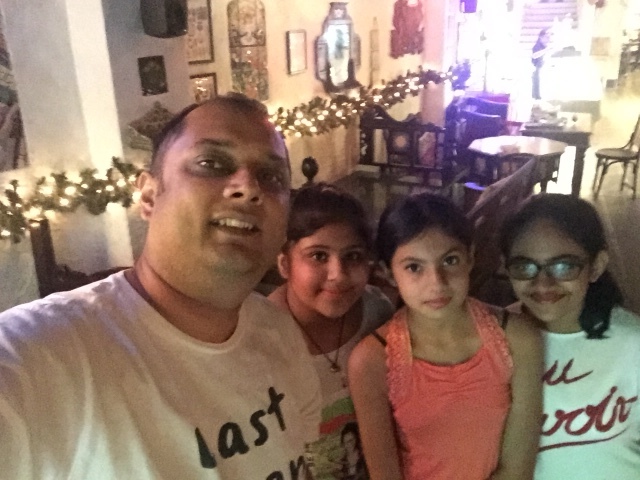 We had gone to Saltwater Cafe in Bandra the previous evening to meet some dear friends of ours ( fellow Salt Water fans) whom we were meeting after a long time. The company was lovely, the food was good. I had the black pomfret which was cooked well and served with a piquant rice which I liked. The problem was that I got one of the back support less benches at Salt Water after a long time. Simon Majumdar Quite agree, back free benches and middle aged men don't mix. I always avoid places like that like the plague. The result of the dinner at Salt Water was an excruciating back pain which started even before the food arrived and spilled onto the next day, screwed up my schedule at work and restricted my movements. 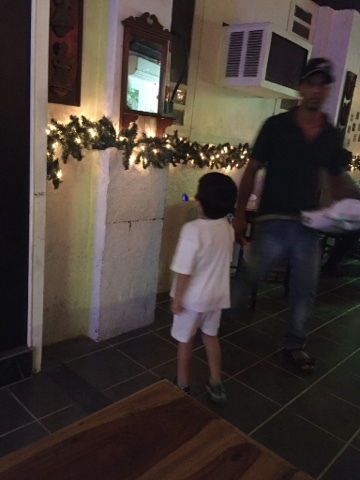 If you go to Saltwater Cafe at Bandra and sit on one of the back support-less then you do so at your own peril. Try to get the tables by the window if you can. Those are good. K took me to Candies the next morning for a bit to cheer me up after I was done with the heating pad for my back. I had decided to grit it out without pain killers this time. 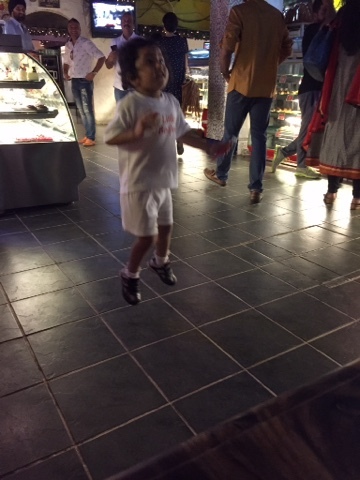 There is a festive air at Candies these days. The Christmas trees are out and they are playing carols on the PA.
We got the comfortable bench (with good back support) by the door on the ground floor where K and I like to sit. This is different from the bench and desk closer to the salad counter where I like to sit and write when alone. The latter is where I am today. Surrounded by really tiny tots blowing Christmas horns that they have got from school and wearing red caps. Coming back to Diya, Prisha and Mishti the previous day, I reassured them that it was ok that they were sitting at 'my table' as I was with K and we were at 'our bench'. That sounds complicated doesn't it? Diya, Prisha and Mishti told me that they love baking and that cupcakes are their speciality. That they love the hazelnut macarons at Le 15 Patisserie and the hot chocolate at La Folie. Two places they read about in the blog and went to after that. They told me that like me, they too are not big fans of dark chocolate. They made a face when I mentioned it in fact. Though I must say that I am slowly beginning to appreciate dark chocolate. And I am sure they will too, like all girls do, once they grow older. We took some pictures together which I promised to put on Instagram and Twitter. By this time their breakfasts were ready at the counter and K was heading back toward me with my double shot cappuccino and chicken sandwiches. 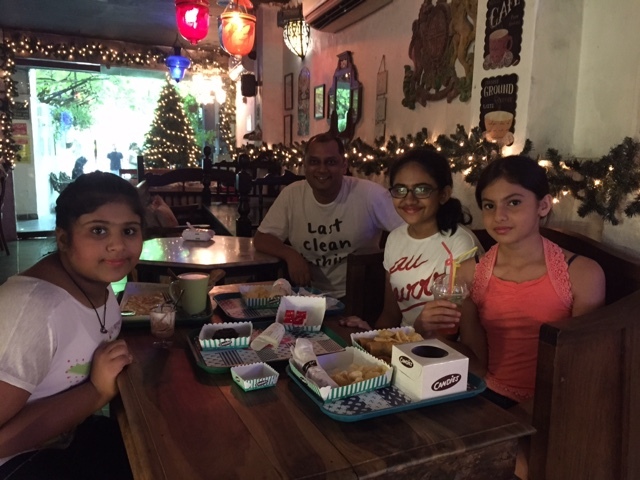 I had gone to Candies to get cheered and thanks to Diya, Prisha and Mishti, my Christmas elves, I sure was. I've been following your blog since the past couple of years, and heard great reviews about "Candies" from you. On my last trip to India, I dragged along my friends (also non-resident Indians) to Candies all the way from Pedder Road to this new place (we left India in 2002, and that time Candies probably didn't exist). On our first Candies visit, it took us exactly 20 minutes to get the attention of the man behind the counter, and another 25 minutes for the food -- by which time we were too harried to care about how the food tasted. Funny thing was that we went on a Monday, when the restaurant wasn't terribly full -- plenty of empty tables around. Even so, we went a second time, and this time too the wait staff seemed equally insouciant. It seems like you have to be a familiar face for them to up their service standards for you. Suffice to say, on my upcoming Bombay trip, Candies is simply not worth the time and gas money. But I still like your blog, and love and look forward to all the stuff you write about the city of my birth, Bombay. Keep writing! !